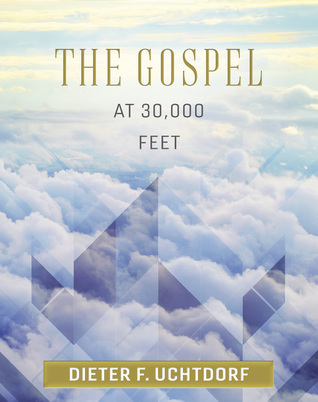 This new book brings together many of the stories of flight that President Uchtdorf has used in his ministry. In this colorful, inviting format, more than 20 of his best-loved stories come together under five major themes: Principles of Flight, Lift, Guidance on the Journey, Weathering the Turbulence, and Our Eternal Destination. Do you know my favorite thing about this book? Yes, it has great messages in it that I've marked and plan to use later, but my favorite thing is seeing pictures of Elder Uchtdorf when he's younger. There aren't many in there, but I was looking at this with my 12 year old and said, "Look at Elder Uchtdorf!" She didn't believe that it was him. I think I like seeing pictures of the apostles while they are growing up because it makes them more real to me. It makes me realize that they grew up and had struggles and problems and had to learn to over come those. But back to the book. I don't think it was meant to be read in one sitting. I think the way it was set up is to be enjoyed in little snatches when you need a pick-me-up. And pick-me-up it does. Doesn't Elder Uchtdorf have a way with words? This was one of my favorite quotes from the book, "The more we incline our hearts and minds toward God, the more heavenly light distills upon our souls. And each time we willingly and earnestly seek that light, we indicate to God our readiness to receive more light. Gradually, things that before seemed hazy, dark and remote become clear, bright, and familiar to us."